Knott’s Berry Farm offers Ghost Town. The one minute, 30 seconds of head-over-heels fun of Boomerang. Camp Snoopy is kids fun. Take a ride on the Calico Railroad and the Bigfoot Rapids water ride. And enjoy the famous Boysenberry Pie and chicken dinner at Mrs Knott s Restaurant. At Halloween time, Knott’s Berry Farm turns into Knott’s Scary Farm where during the day Camp Spooky takes the stage, and ghouls and zombies rule the night. 3) Snoopy standing facing left. 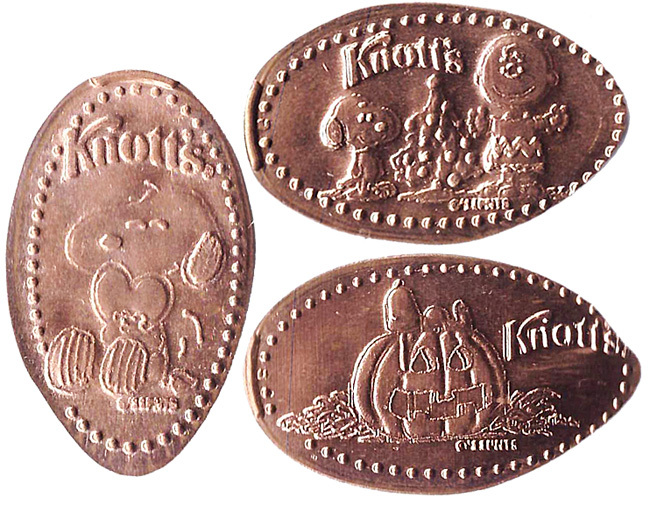 The current penny book is titled "SOUVENIR COIN ALBUM" and depicts a scene with several iconic Knott s Berry Farm rides and includes a pressed penny on the cover with the Knott s word logo: "Knott s BERRY FARM"